BIOS Agro Sprint is a mix of processed noble animal proteins, rich in amino acids and peptides, ready for absorption. 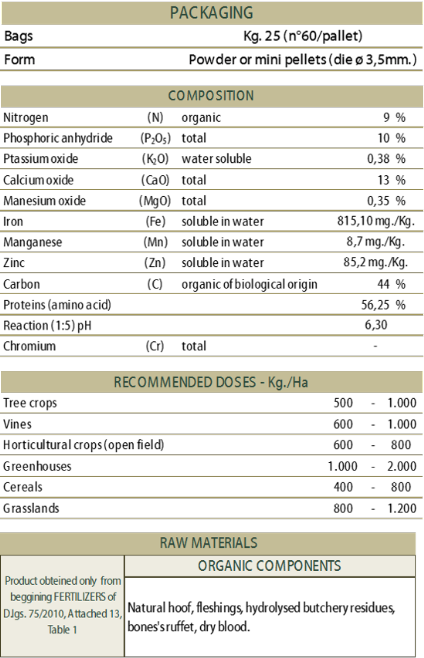 Suitable for any types of cultivation, both in full field and in protected crops, BIOS Agro Sprint releases the primary elements since the initial stage of being released in the soil allowing a constant transformation of the proteins and facilitating the release of nitrogen, phosphorus, calcium, micro-elements and humic and fulvic acids in a balanced way over time. Apart from different organic Nitrogen forms that are present in order to make it available throughout the production cycle, its endowment of meso and micro elements makes it perfect in any farming stage and throughout the year in any season.